With this kit you get two Ubiquiti Loco M5 outdoor APs - preconfigured and ready to mount. 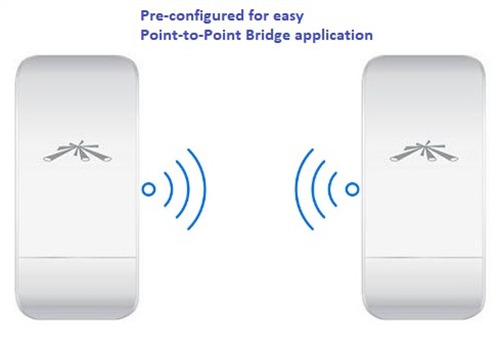 Point-to-Point Outdoor Bridge, 2 x LOCOM5 802.11n/a 200mW Outdoor AP, pre-configured to create a plug-and-play outdoor wireless bridge. Includes Power over Ethernet supply and New Zealand power cord. 150+ Mbps real outdoor throughput and up to 1km+ range. Featuring 2x2 MIMO technology, the new NanoStation links significantly faster and farther than ever before. New antenna array designs featuring 13dBi dual-polarity gain at 5GHz. Optimized cross-polarity isolation and in a compact form-factor. Ubiquiti's AirOS builds upon the market leading intuitive user-interface loaded with advanced wireless configurations and routing functionality.